Class enrollment is always open! No semester commitment required. Enrollment is month-to-month throughout the year (including summer). Your child is automatically re-enrolled each month until you provide written notice of withdrawal by the 10th day of the last month of class. Contact us to schedule a FREE trial class! Print and complete Above the Bar Waiver & Registration Form for class trials and new enrollments. 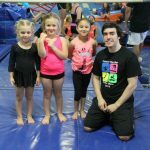 Co-ed classes for boys & girls ages 16 months up to 6 years are designed to introduce and develop fundamental gymnastics skills. This is a 45 minute parent/guardian & child class requiring direct guardian involvement. 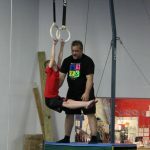 Through the guidance and direction of a terrific ATBGA instructor, you will guide your child through a variety of activities including: parachute time, stretching activities, large motor skill challenges, obstacle courses, fun songs, bars, beam, vault, floor exercise and trampoline activities. The curriculum is designed to enhance and challenge your toddler’s gross motor skills, loco-motor skills, and spatial awareness. The consistency of the class provides a sense of security to your little one and he/she will feel empowered in knowing what to expect! This class is great for teaching your child to associate fun with physical fitness, building his/her confidence, while encouraging bonding between guardian and child. $70/month for 1 class each week. This is a 45 minute class designed to increase your child’s physical strength, coordination and listening skills through activities that are fun and challenging. 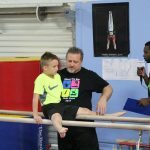 Apparatus training includes vault, bars, beam, and floor exercise as well as games and exercises that enhance gross motor, loco-motor, and spatial awareness. Children under the age of three must have instructor approval and demonstrate that they can stay on task and follow directions. $70/month for 1 class each week. 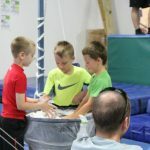 This is a 55 minute class that continues to build your child’s strength, coordination, and flexibility through activities, games, and obstacle courses that are fun and challenging! Goals include development of self-confidence, a love for sports, and basic gymnastics skills. 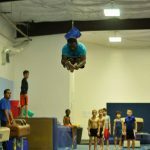 Apparatus training includes vault, bars, beam, tumbling and trampoline. Children under three and a half years of age must start in the DynaTykes class until they are able to follow directions and stay on task. $85/month for 1 class each week. 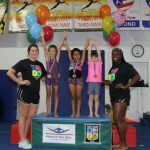 This is a 55 minute class designed to prepare children entering or in Kindergarten into school-age gymnastics, tumbling, and athletics. The curriculum is focused on developing strength, confidence, flexibility, and independent skill training. Athletes will focus on basic skills and drills that facilitate their transition to training on full size apparatus. $85/month for 1 class each week. 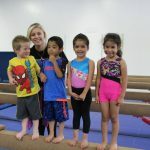 Classes for boys & girls ages 6 years & up are designed to progressively develop gymnastics skills as far as each student desires. No experience required to start. Students progress at their own pace, not by age or schedule. Choose one or more classes per week. 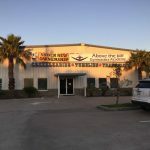 Mix or match classes at either location. $85/month for one 55-minute class each week, $130/month for 2 classes, $170/month for 3 classes. 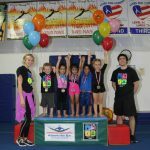 This 55 minute class offers a curriculum that follows USA Gymnastics Level 1 skills. Through drills, the young gymnasts will develop the strength and flexibility necessary to do progressive gymnastics. Goals include: developing a passion for fitness, healthy living, and gymnastics. Our motivated coaches focus on developing confidence in young athletes with positive feedback. The curriculum is comprised of attainable levels of training that will challenge athletes and promote skill development. 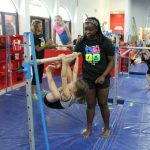 This 55 minute class offers a curriculum that follows USA Gymnastics Level 2 skills. 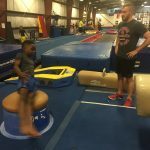 Through drills, the young gymnasts will develop the strength and flexibility necessary to do progressive gymnastics. Goals include: developing a passion for fitness, healthy living, and gymnastics. Our motivated coaches focus on developing confidence in young athletes with positive feedback. The curriculum is comprised of attainable levels of training that will challenge athletes and promote skill development. 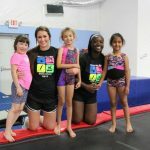 This 55 minute class offers a curriculum that follows USA Gymnastics Level 1-3 skills. 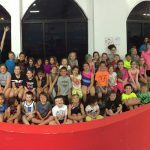 While the curriculum is the same as for the 6 to 9 year old gymnasts, tweens and teens are grouped together for that sense of fellowship with athletes their own age. 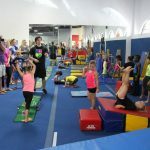 Classes for boys & girls ages 6 years & up focus on gymnastics floor tumbling skills. No experience required to start. Students progress at their own pace, not by age or schedule. Choose one or more classes per week. Mix or match classes at either location. $85/month for one 55-minute class each week, $130/month for 2 classes, $170/month for 3 classes. The focus of this 55 minute intermediate class is to develop strong foundation for power tumbling. This class will teach tumbling basics through progressions that increase strength, flexibility, and form. Tweens and teens are grouped together for that sense of fellowship with athletes their own age. Athletes will warm up, work handstands, drills, line tumbling, and floor stations. This class is an advanced power tumbling class. Athletes must be able to perform a Round-off back handspring to enroll. Class includes line tumbling, drills, and power tumbling. Active members may schedule private lessons with a coach. Non-members must register to be a member of the gym prior to scheduling private lessons. Coaches will schedule and collect payment for private lessons they give. Rates for privates are set by each coach. Payments for lessons must be made by cash or check directly to the coach. The gym will no longer accept credit/debit payments for privates. Each coach is responsible for keeping a log book with his/her private lessons. When payment is made, parents sign the coach’s log to verify his/her receipt of payment. Honesty on the part of both parties is required for this policy. Private lesson cancellations must be made at least 24-hours in advance. Cancellations made less than 24-hours in advance may be charged 100% of the scheduled private, at the discretion of the coach.